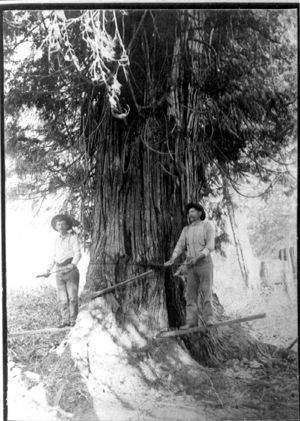 In this early 1900’s photograph, John Barlow and Alfred Kerola are standing on spring boards, as they start the undercut in preparation for felling this large Western red cedar tree with a crosscut felling saw and axes. The location of the tree is unknown, but it is possible it was on the Barlow farm grounds. From the Digital Collections: Back to School!